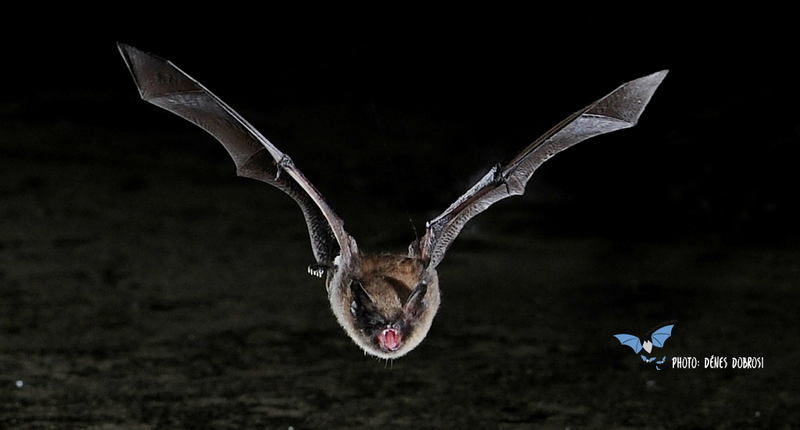 How do bats see in darkness? Bats have always intrigued scientists about their way of navigating in darkness, even more so because we do not feel their presence around us. They do not scream, as birds do, nor do make other noises, like nocturnal animals such as the wolf, howling to the full moon, or wild boars and bears that grumble. Bats fly silently and hunt mosquitoes, moths and other delicious insects around them with precision. The only thing bats are interested in are to avoid obstacles and predators, eat well and sleep much. Bats are not interested in our hair, they being able to detect even thinner lines and obstacles. They have no business with and in our hair. But how do bats navigate? By echolocation, which they use both for orientation and communication, and for capturing those delicious insects. 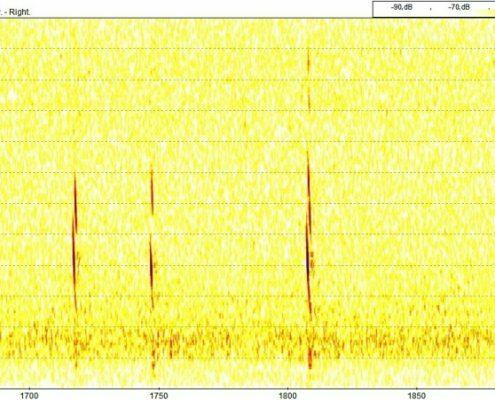 Specifically, bats emit sounds at frequencies above 20 kHz, called ultrasounds, which people cannot hear (except for the sounds of noctules, that are below 20 kHz). Depending on the species, bats emit ultrasounds through their mouth or their nose, in any direction they want to scan. If there are obstacles, walls or insects near them, the sounds return to the bat in form of echoes. 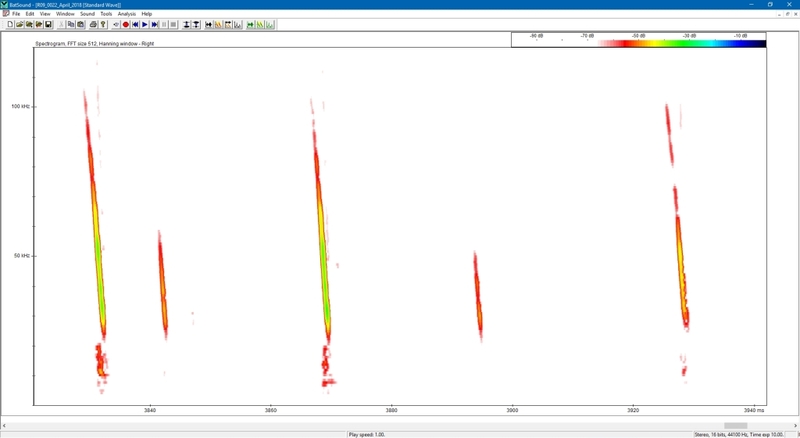 Echoes are received separately with each ear separately, thus the bat can calculate direction, distance, as well as determine the nature of the objects around it. Bats receive the details about the type of surface around them, or about the size of the insect that will (or will not) be pursued. With these same sounds they can avoid predators. While flying at high speeds, bats need to constantly avoid collisions. Otherwise, they would hit every obstacle around them, and that would attract the attention of owls, that would laugh in the night, before eating these clumsy bats. 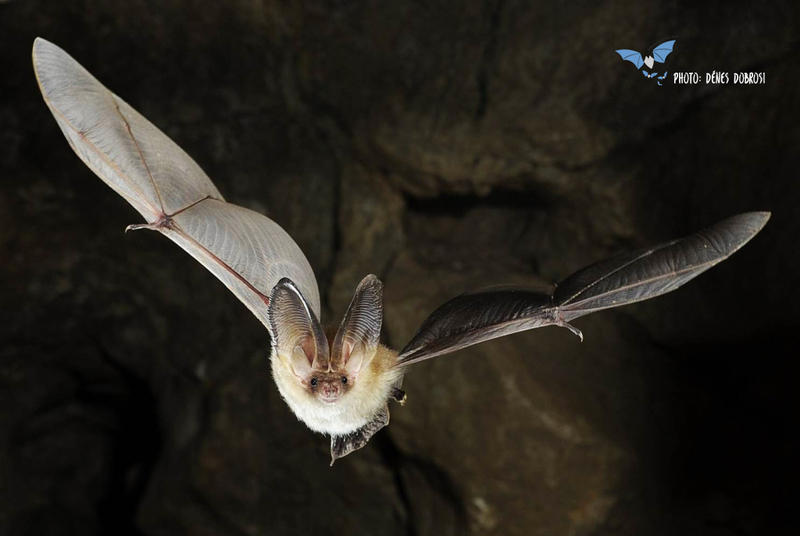 Due to their nature, or more likely because they can detect and catch insects from all directions, bats seem to have a chaotic flight, different from that of birds. 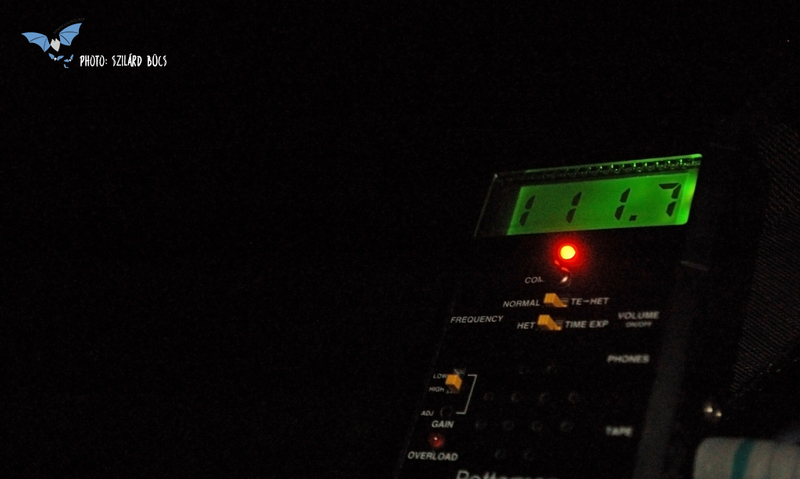 In fact, this flight is finely tuned, perfectly calculated. How do we know that bats are around us, if we cannot see them? This was a question scientists have long been asking. And to answer this, they invented bat detectors, ultrasound detectors! 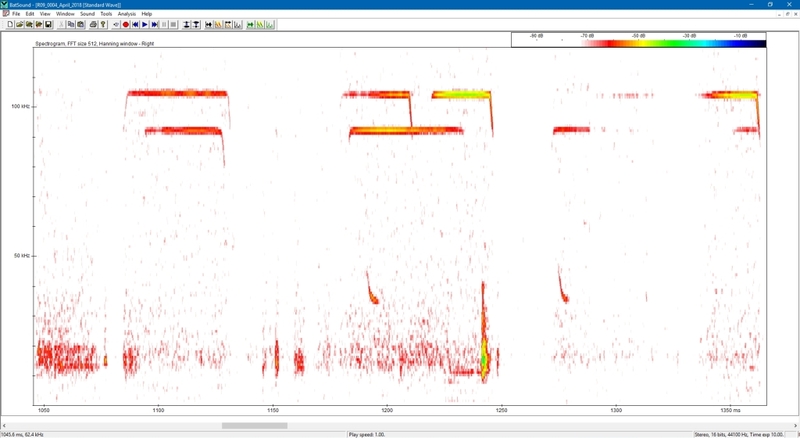 The ultrasound detector is a device that allows the listening, recording and storing of bat ultrasounds, which later allows the identification of species based on ultrasound analysis. As a rule, ultrasound detectors convert sounds of 20-120 kHz (unperceivable to human ears) into audible sounds (below 20 kHz). 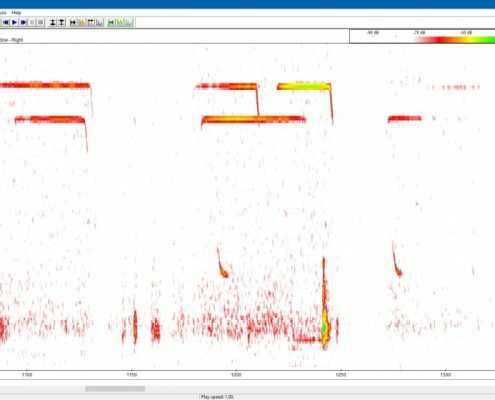 After they invented ultrasound detectors that scan the frequencies at with bats emit, they also realized the need of special software that analyzes these sounds. 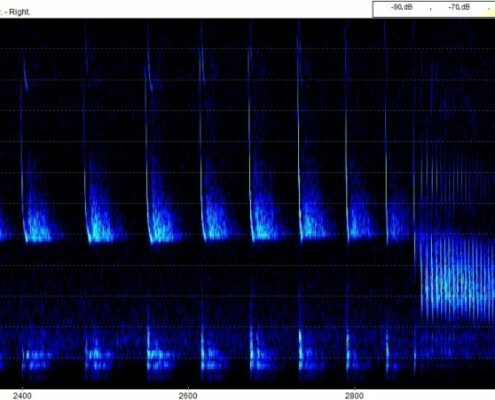 These software visualize the ultrasounds in form of spectrograms, that allow the measurement of frequencies, duration of sounds, pulse intervals or other parameters, and based on all this, as well the shape of the pulses, give a verdict on the identity of the species. That is, to determine the identity of the bat species based on their ultrasound alone. This is because bats are not robots, but living beings, and they adjust their sound structure depending on circumstances or the area through which they fly. 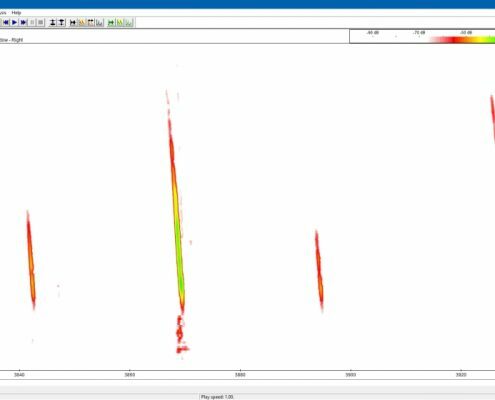 For example, the structure of the sound depends largely on the type of habitat in which the bat is flying: certain types of sounds are emitted in an open space (such as an agricultural area), and the structure changes when the bat reaches a more closer, cluttered environment, ex. the inside of a forest. By emitting sounds more frequently, the more frequent echoes offer more information about the surroundings. Depending on the species, bats emit ultrasounds at certain frequency, but while some of these frequencies are species specific (ex. Rhinolophus hipposideros emits only above 108 kHz), there can be overlap between other species. It is like, in a group, everyone would speak the same tone and the same dialect in the dark, and of course, you would not know exactly who you are talking to. 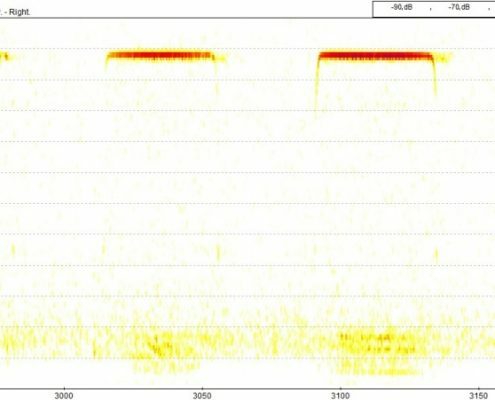 There are also more cunning bats, which try to mislead scientists (and not only them) by using several pulse structures in the same sequence of sounds. And they often succeed in confusing us. Noctules and barbastelles alternate sounds of different structure, but they can also use them separately. 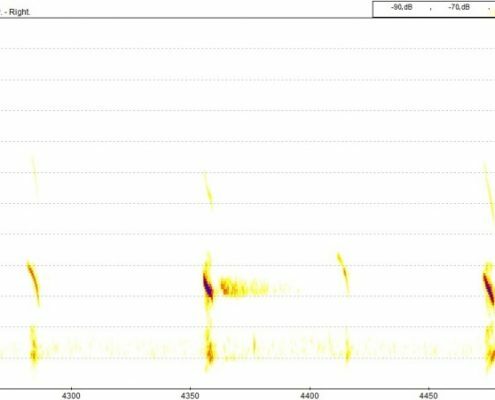 If bats pass too close to the ultrasound detector, the received sound can create confusion, and we do not know if it was a noctule, a barbastelle, or a long-eared bat. But nothing can be confused with the typical sound of horseshoe bats, which emit long and whistling sounds, at a constant frequency of more than 79 kHz. At this stage, preceding the actual capture of the insect, the bat decreases the frequency of the sound it normally emits, and after a brief break following capture, returns it to its usual frequency. In the case of bats approaching water surfaces in order to drink, decreasing the distance between the pulses takes place linearly, without the sudden drop in the frequency they use before capturing. And when there are more bats of the same species in an area, each individual slightly increases or decreases their sound frequency, in order to differentiate their sounds from the sounds of the others. No matter how difficult it is for specialists to differentiate between species in certain situations, there is no error or confusion among bats, with orientation and detection being, in most cases…..impeccable!